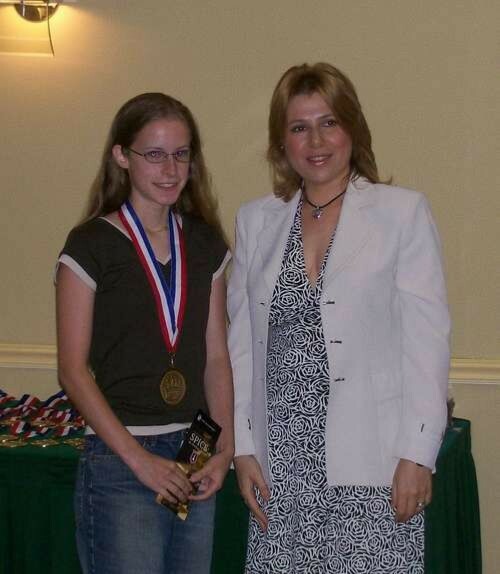 08.14.07 Maine's representatives to the Denker Tournament of High School Champions and the Susan Polgar National Invitational for Girls both finished above their seeded positions based on rating. The 2007 Maine High School Co-Champion Cullen Edes finished tied for 13th place in a very strong field of fifty-one players including six masters and twelve experts. The 2007 Maine Girls Champion Lily Briggs also bested her seeded position of forty-sixth with a tied for thirty-fifth place finish out of forty-nine players. Lili Briggs and Cullen Edes playing in round 1 of the Denker/Polgar tournament. In a field of all state champions there are no games that can be called "gimmies." 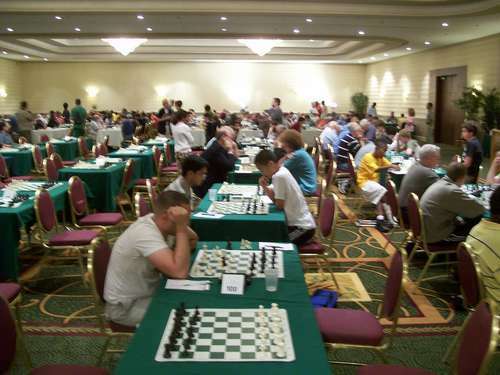 So it was for Maine state champions Cullen Edes and Lily Briggs at the Denker and Polgar tournaments played alongside the U.S. Open in Cherry Hill, New Jersey from July 29 - August 3, 2007. After six grueling rounds of competiton versus players with an average rating of 1918, Edes scored 3.5 points to tie for 13th overall. He started the tournament strong with a fine draw against the Massachusetts high school champion, Matthew L Klegon rated 2142. After a second round loss to Luke Hellwig (1841) of Alabama, Edes regained his composure to win two straight vs. Daniel Aldrich (1529) of the District of Columbia and Todd Whitehouse (1877) of Kentucky. Edes split the last two rounds one and one first with a loss to Pennsylvania champion and master strength player Daniel Yeager (2247) and then a last round victory over Daniel Taylor (1874) of Indiana. In the Polgar National Invitational for Girls, Lily Briggs got off to a disappointing start with three losses against Amelia Wheeless (1725) of North Carolina, Catherine Oliver (704) of Nebraska and Laticia Leftwich (991) of South Dakota. Far from Lily to throw in the towel, she won her next two games over Eliza Mc Intosh (1023) of Utah and Alea Ford (1097) of Indiana. In the last round she lost an interesting struggle to Sarah May (1487) from Washington state. All in all a respectable peformance finishing tied for thirty-fifth place--eleven places higher than her seeded position at the outset. 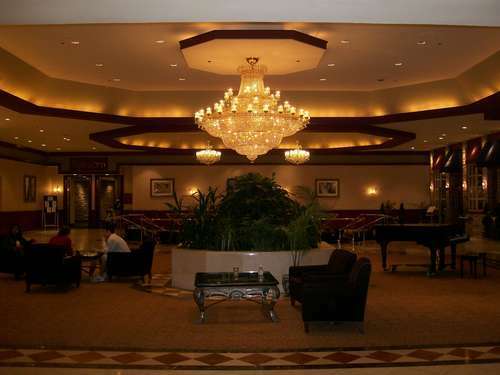 The Crowne Plaza Hotel in Cherry Hill, New Jersey. 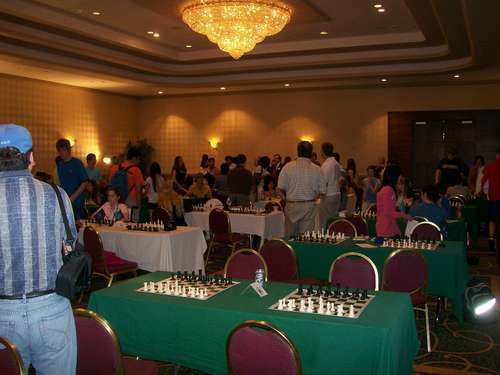 The lobby of the hotel and..
Lily Briggs (right) plays North Carolina champion Amelia Wheeless in round 1. 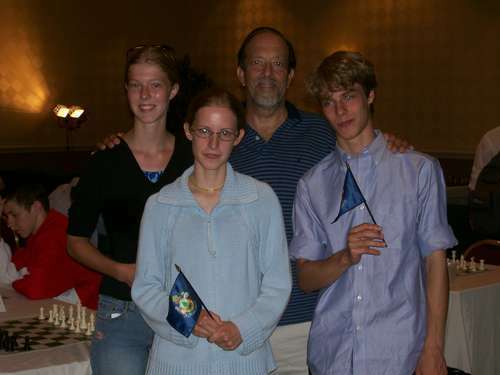 From left to right, Cullen's sister Sorel Edes who played one game in the Polgar tournament as a "house player," Lily Briggs, Mitchell Denker (GM Arnold Denker's son) and Cullen Edes. Lily receiving a medal and congratulations from GM Susan Plogar. 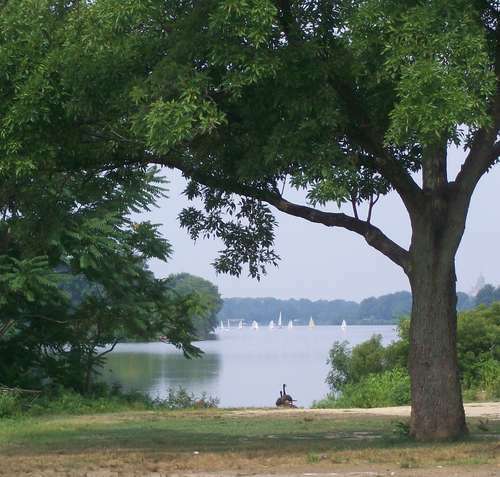 Between rounds players could watch sailboats and geese and take a breather at this nearby lake. Lily plays 2. e3 in round 2 vs. Catherine Oliver of Nebraska. Northern New England girls champions: Lily Briggs (Maine) and Avary Bell (New Hampshire). The U.S. Open was played concurrently. Cullen Edes' games from the Denker tournament coming soon.